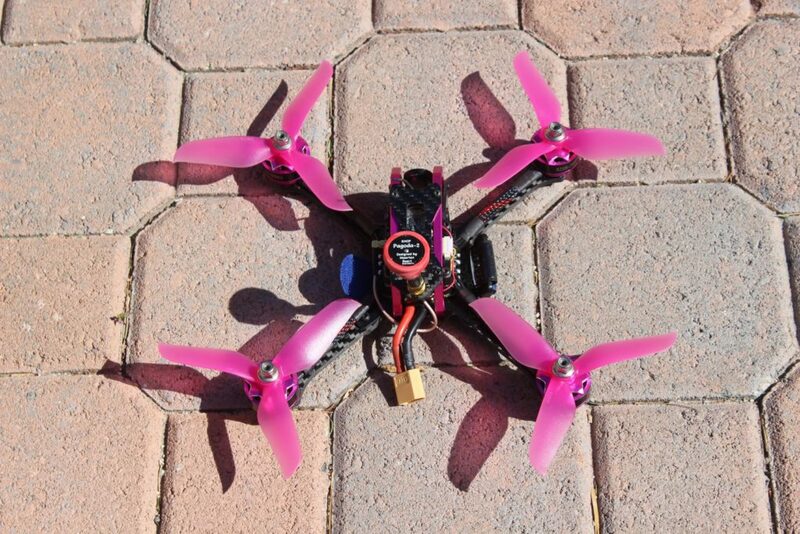 FPV racing has not only exploded onto the hobby scene but onto the mainstream as well. 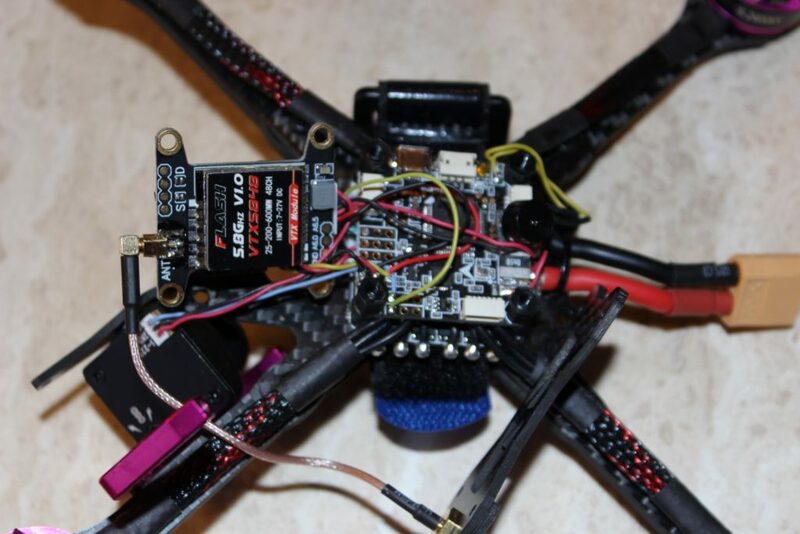 Manufacturers are scrambling to get onboard and some are doing so with models built with the same types of discrete components racers and freestyle pilots demand, less the need to assemble and solder everything in place. One manufacturer leading the charge is the strangely named FuriBee. Strange though the name may be, the FuriBee GT 215mm Fire Dancer brushless FPV racing drone exclusively from GearBest.com is anything but. 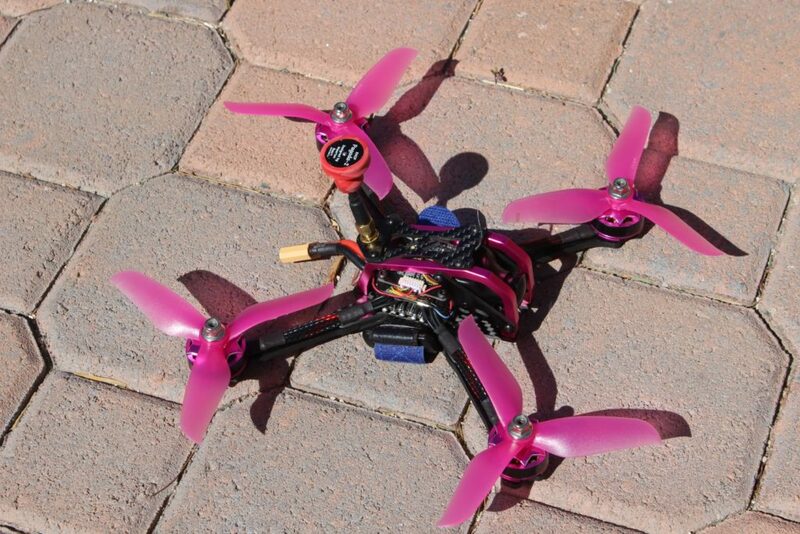 For well under US$200 less batteries, radio, goggles and in one example, a receiver, the buyer gets a surprisingly well-crafted racing/freestyle FPV quad ready for binding to a DSMX, FlySky or FrSky radio. A receiver-ready version is available for racers who choose to use other radio brands. All are available with several free shipping options to the US plus a very affordable expedited option. 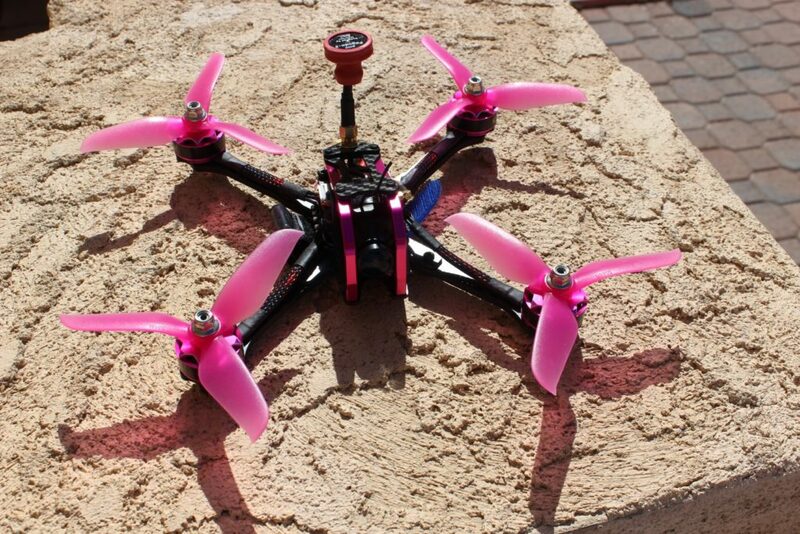 I’m fortunate to have a FrSky Taranis X9 Plus which is a popular choice for FPV quads. The FrSky version is available here for US$159.99, an outstanding deal given the vast programming potential of these radios. Electrons will be flowing from GaoNeng 4S li-pos from GearBest in both 1300 and 1500mAh capacities each with an incredible 110C claimed discharge rate. These arrived after my initial line-of-sight flight tests. GearBest sent a ZOP Power 1300mAh 4S 45C pack for a previous review subject which I used for those tests. 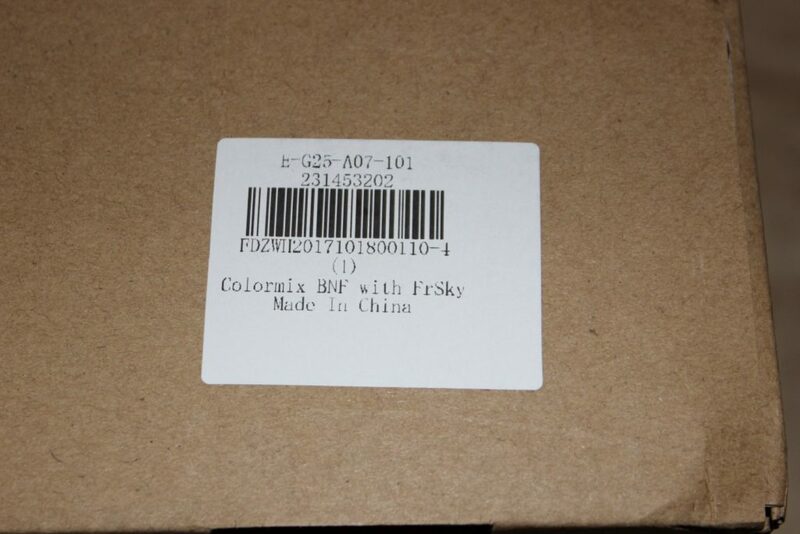 Manufacturer: Shenzhen Chengmeijia E-commerce Co., Ltd.
Packaging wise, the trend for models such as these trend toward plain brown cardboard with a small label identifying the version. 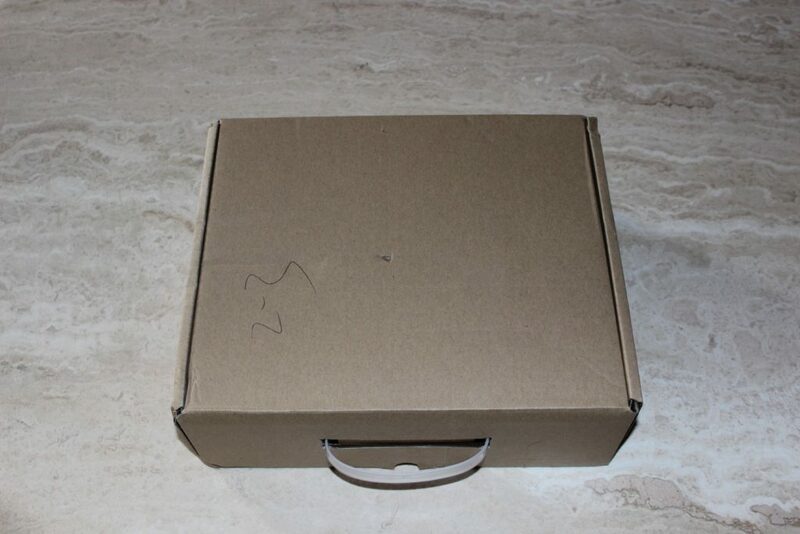 Nice things often come in plain boxes and the contents were a real treat for the eyes. The Fire Dancer came in a thick foam tray similar to those found in hard shell cases. There’s even a compartment for carrying batteries, although the propellers will have to be removed if the box is used for storage or transport. The model itself is beautifully rendered in CNC milled carbon fiber and magenta anodized aluminum with matching motor endbells. Styling is the currently popular aluminum “fastback” frame design which should do an excellent job of protecting the camera and the electronics. Wiring is neatly hidden in woven looms secured with shrink wrap tubing; the color of the weave shifts from magenta to black depending on the viewing angle. 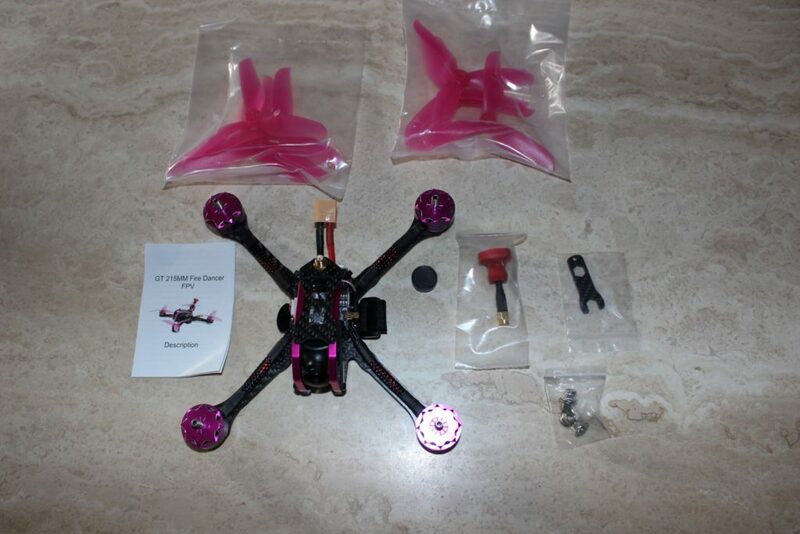 In my opinion, the benchmarks for these types of carbon fiber framed quads come from Armattan Quadrocopters and also in my opinion, the Fire Dancer’s frame does a passable imitation of an Armattan. An LED status panel is at the rear above the battery connector, but the quick start guide gives no indication of what the lights represent. In fact, the manual is lacking in all but the most basic startup info. There are two unidentified sockets on the FC board as well as a micro SD card slot. Great, but how does the onboard recording system work, assuming that’s what the SD slot is for? I’ll take an educated guess and say that the slot is for recording telemetry data during flight since it’s part of the FC board. Far more straightforward is the binding procedure which varies between versions, so I won’t belabor the point. Once bound, I hooked up the model to my computer, fired up BetaFlight and checked the settings. FuriBee does something no other manufacturer of which I’m aware does, that is, to set all of the basic parameters from the factory. All that I needed to do was to set the accelerometer calibration (a simple task on BetaFlight) plus the arming, angle and horizon settings to my preference. 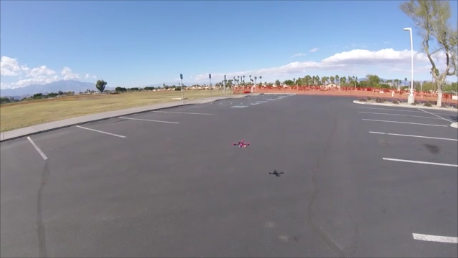 With the props installed, it was time to give this quad a test whirl. Speaking of the props, I suggest caution when installing them. The cooling vents along the bottoms of the motors are quite sharp, an issue raised by several bloggers. My initial testing took place out in front of my house where I checked the usual parameters, i.e., control response, climbout, handling, etc. Let’s say that modern ESC and other firmware protocols make for a smooth ride with totally locked-in control. The FuriBee is small and stable enough to be flown – or at least hovered – indoors, but where this model shines is in a situation which allows its pilot to do some real yank-and-bank flying. 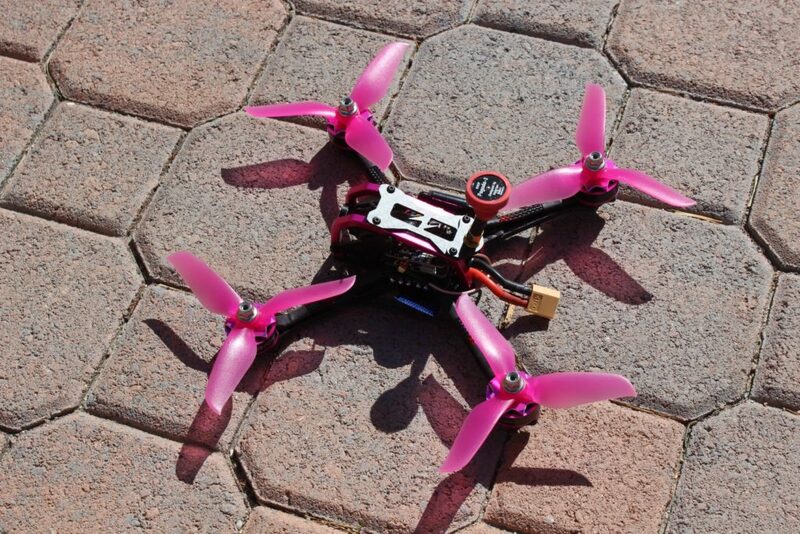 It’s a fantastic sport quad, limited only by its size since it punches out so quickly. It’s really easy to lose orientation, although one should be OK as long as one pays attention to the orientation in flight. I need to point out once again that I’m reviewing a factory assembled quad with universal components requiring minimum setup with a commonly used program. While it proved to be fun to fly line of sight in initial tests, I was really looking forward to the opportunity to open it up and give the FPV a whirl. IMPORTANT NOTE: I should mention that any FPV video transmitter of this type with an output power above 25mW requires a Technician Class amateur radio license or higher here in the United States. It’s a relatively simple test, there’s no need to know Morse code for any of the three licensing levels and it’ll open up a world of fun, believe me. 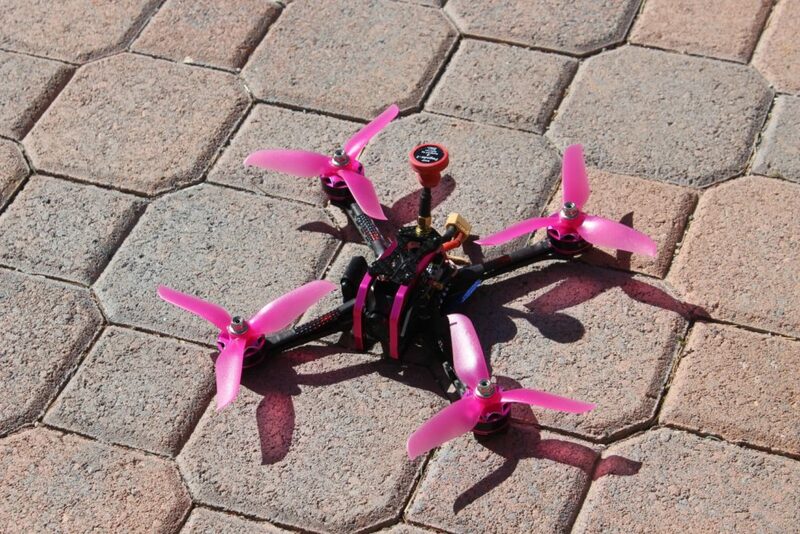 The AMA has information about such FPV use and it can be found here. Many areas have local amateur radio clubs which can conduct a class and administer the test. I highly recommend looking into the terrific Technician Class book by Gordon West and by visiting the American Radio Relay League. For readers outside the United States, I recommend contacting your telecommunications agencies. My FPV tests began at Palm Desert Soccer Park, a wide open area in Palm Desert, California perfect for flying goal-to-goal FPV sorties. First, I wanted to do some more line-of-sight and the park had plenty of room to let ‘er rip. The technology which goes into these machines is nothing short of awesome. High-speed climbouts, fast fly-bys and graceful slow flights, hovering and pirouettes made flying the Fire Dancer a genuine pleasure. The camera has its own selectable OCD, but it’s unnecessary since the FC board generates its own. Shown are time spent armed, time spent flying, flight battery level and an artificial horizon. 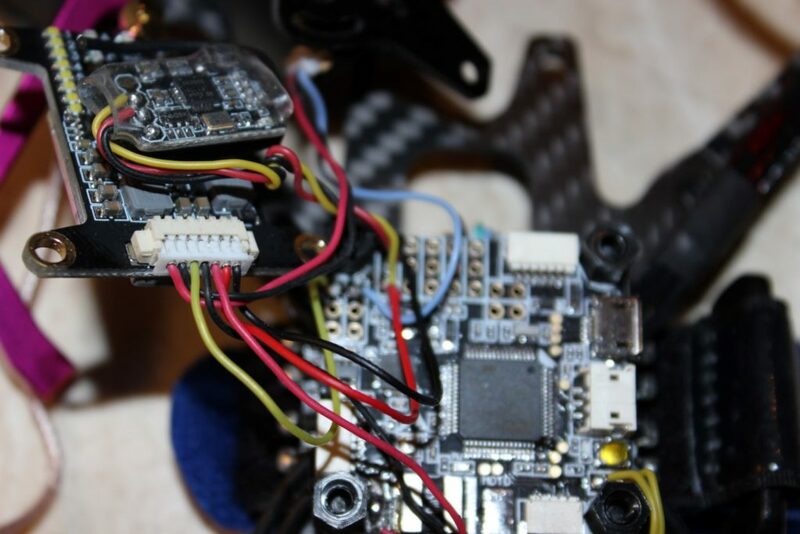 Disarming the model brings up a recap of information such as battery usage and optional “black box” info which can be engaged via BetaFlight. If a version less the camera and VTX were offered, I’d jump on one in a heartbeat just for the fun of flying. Since my go-to RC-007 FPV goggles have no DVR function, my only choice was to use my Tactic goggles with a removable monitor. This is when a common and to me, previously unknown problem with this model occurred. The VTX actually changed channels on its own and left me flying blind just long enough to allow a crash into the middle of a nearby tree! More on this in a moment. Although the video I shot was unusable, the crash into the branches and subsequent drop to the ground showed how tough a customer this quad happens to be. The only casualties were the battery strap (its buckle tore out) and the breaking of the power going to the mystery LED panel at the rear, which I’ve since removed. The model captured the attention of three young boys who not only helped me recover the model but were utterly fascinated by it. If anyone in our audience doubts the allure of flying models to the younger PlayStation 4 set, these tech-savvy lads immediately put that notion to rest. 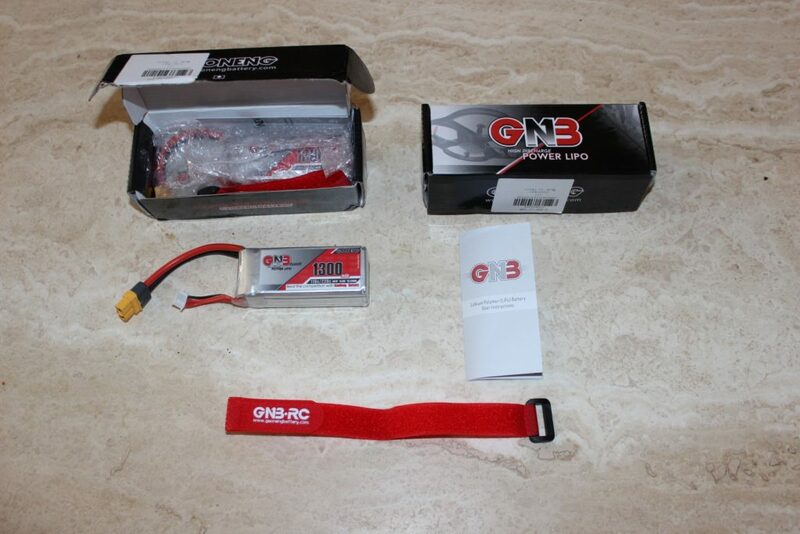 All four GaoNeng batteries came with nylon straps, but I felt they probably weren’t up to the task. The batteries themselves have proven to be more than up to the task of powering this little speed demon. I knew I had something better. It was a sturdy, well made “sticky” strap from Mark Grohe at 2dogRC.com. Mark sent this strap to me a few years ago along with some batteries and I hadn’t the opportunity to use it until now. It’s not only a perfect fit, I highly recommend it as an upgrade. At a buck and a half a pop, these straps are a real bargain and can be found here. FLIP! The VTX changed channels. I yanked off the goggles, chopped the power since I couldn’t see the model and I tried to use the video feed from the goggles to get a fix on the model’s location. Easier said than done; once I established a link, the VTX continued switching channels and bands. Again, there was no damage whatsoever to the model, so I thought I’d try again, this time keeping it closer to me than before. FLIP! Channel change, chopped power, same results and again, no damage. A final test took place at the Coachella Valley Radio Control Club in the valley’s rural eastern half. This time, I had my grandson Stephen along to serve as an observer while I tried to use the Tactic’s DVR function once more. Sure enough, it changed channels. Another flyer had his own FPV goggles and he offered to monitor the signal as well. He was experiencing the same issues. Thinking I had a bad VTX, I emailed Anny, my GearBest contact. There wasn’t anything she could do at the moment; she was vacationing during Chinese New Year but was kind enough to email me to let me know. Research turned up some interesting information. The factory solders the SBUS lead of the VTX to the SBUS of the flight controller. This is so one can switch transmission bands and frequencies via the transmitter. Even if it isn’t programmed (mine wasn’t, again because of no directions), normal power surges during flight are enough to trigger the channel change. 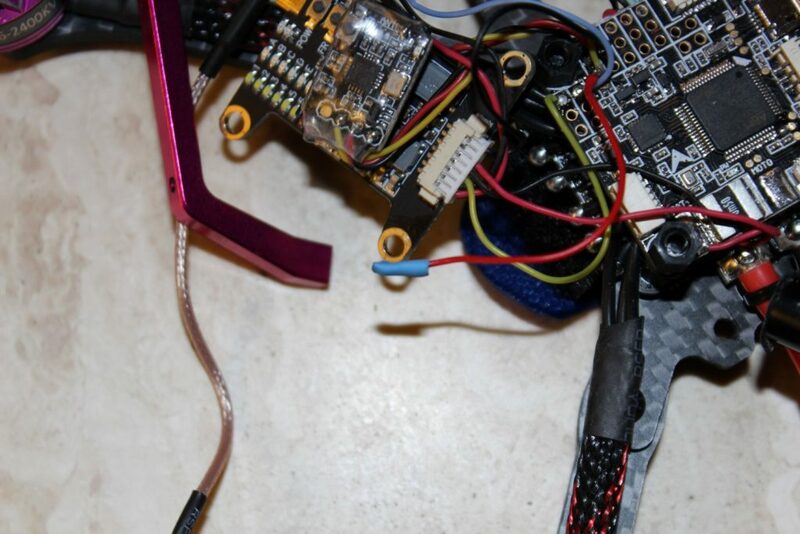 Trying to either trace the wire or accessing the plug on the VTX made disassembly necessary, that is, before I discovered the location of the wire on the GearBest sales page which I’ve linked a bit further down. I’m glad I did since none of the metal-to-metal attachments had any thread locking compound applied beforehand! This was a bunch of loose hardware simply waiting to happen. Every screw which attaches to anything metal whether on the frame or at the motors is now secure. As for that wire, it’s the red one second from the right when looking at the plug from the right side of the quad. Since this model seems to be available exclusively through GearBest at this time, I would suggest to them that a technical bulletin addressing both issues is in order. Manual channel, band and power output changes are as easy as pressing clearly marked microswitches atop the VTX, making the remote change features unnecessary in my opinion. Ah, but which was the SBUS lead? Nope. No manual. Once I found it based per my above comments, I popped the wire from the plug with the tip of a hobby knife, isolated it with shrink wrap tubing and tried again the next day. I kept it simple by flying line of sight in front of the house while both monitors were operating on the other side of a wall in my front yard. The VTX was on full power as a precaution. That did the trick! The RC-007 goggles worked perfectly and the VTX never once flipped channels. Returning to the big Southwest Community Church for video netted the onboard footage in the YouTube video linked below and line of sight was virtually free of dropouts when viewed with the FPV goggles. 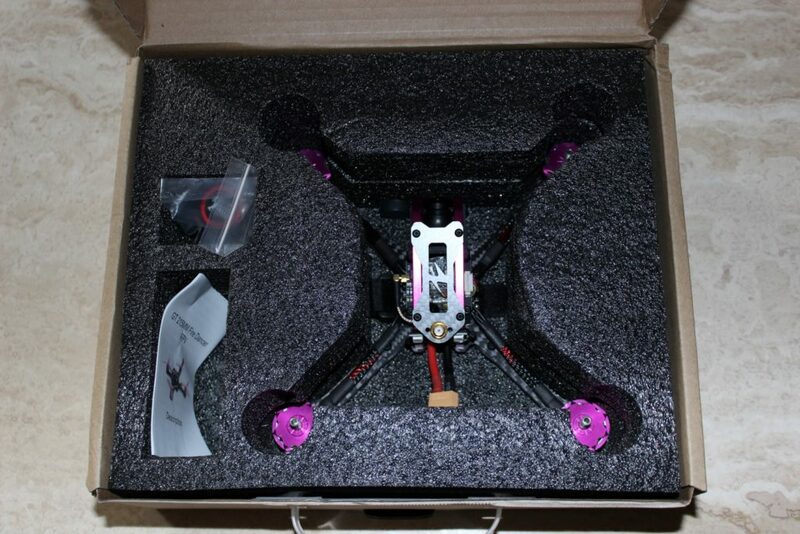 The location of the wires and a basic operating manual may be seen here on the sales page for the VTX. With each new release, GearBest becomes more of a real player in the RTF hobby market. 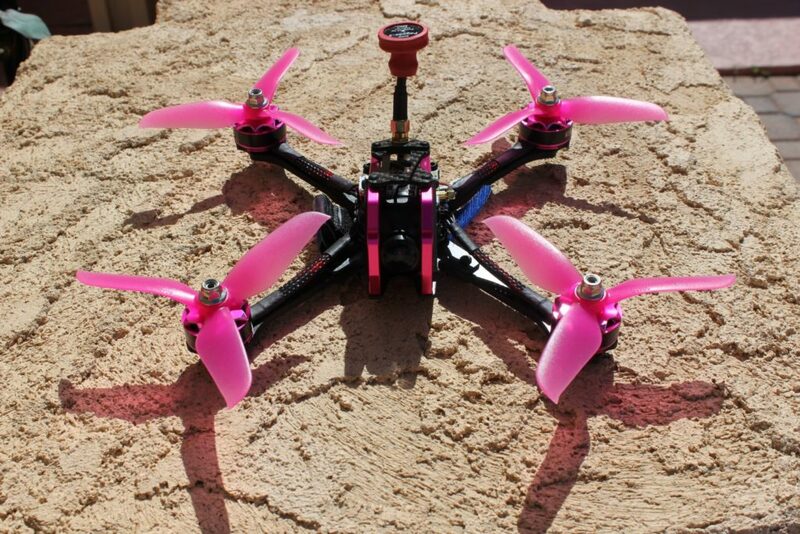 The FuriBee GT 215mm Fire Dancer FPV racing drone is almost such a release. It’s a magnificent flyer, rugged, fun and easy to set up. This is a very powerful and fast quadcopter capable of inflicting some serious hurt on anything – or anyone – it might hit in flight. Random VTX channel changes, unsecured hardware and a near total lack of documentation make for a model which requires the end user to prep it beforehand, perhaps unbeknownst to that user. Simply binding, setting up and flying aren’t enough and it’s easy to assume that they are. Thankfully, there are online resources such as RC Universe here to help and I respectfully suggest to GearBest that they not only do the tech bulletin I suggested, but to begin stocking parts which can be express shipped to customers. That would be a huge step forward. Perhaps they should consider having a hobby hotline as well. In the meantime, I’m glad the glitches happened to me and not to a customer. I give this model 1 1/2 thumbs up as delivered and two thumbs up after it’s properly prepped for flight. Anny is my terrific contact at GearBest who made this model and some batteries available for this review. Nathan Maat is the man at the admin’s desk here at RC Universe and I thank him as always for the work he does on behalf of our readers. Thanks for the visit!